This sake is made from 100% Takashima Omachi rice. Omachi rice has originated in Okayama City's Takashima district and started being cultivated at the end of the Edo period(1603-1868). This rare regional rice for sake making, Takashima Omachi, is polished to a 38% milling ratio. This is a superior quality Junmai Daiginjo sake brewed from Okayama’s plentiful, fine quality water and traditional Bitchu-style brewing techniques. Having a gorgeous and elegant fragrance specific to Ginjo sake and a mild, expansive taste are characteristics. Chilled or at room temperatures, a great harmony of flavors fills the mouth when paired with Sawara(mackerel) and other seafood from the Seto Inland Sea. Of course it also pairs superiorly well with richly flavored tuna and sushi, as well as delicious red meats such as beef and more. This is a special Junmai type sake made from Takashima Omachi, a rare local rice for sake making that is polished to a 60% milling ratio. This sake has a mellow fragrance that recalls other fruit, and balances well with the elegant umami flavor of the Omachi rice; it also has a sharp and clean taste. It can also be enjoyed slightly warmed. Usually 'nigori' or cloudy sake is made by putting large quantities of alcohol and sugar into regular sake; however, the brewers at Miyashita Sake Brewery have been trying for several years to develop a nigori sake that has a high level of pure whiteness; finally, they were able to develop a nigori sake of the Junmai Daiginjo type that is made from highly refined Omachi rice.  This is a luxurious sake that draws out the umami flavor of the Omachi rice within a delicate and elegant taste. Korakuen, one of the three most famous traditional gardens in Japan, the Omachi cold spring, and the region where Omachi rice was first cultivated are all located nearby; even though the brewery is located in the prefectural capital city, it is blessed with conditions for making good sake. The brewery began operations in 1915. 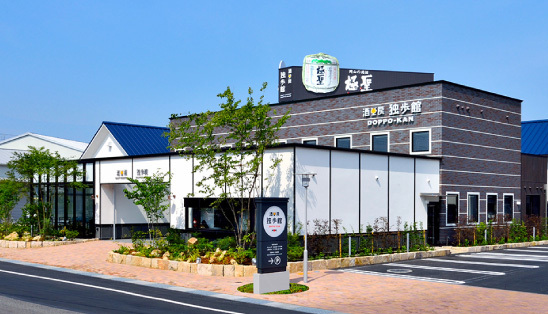 After their father died in their youth, the brothers Kamezo and Motosaburo Miyashita were raised by relatives who were involved in brewing, and putting their experience with family into practice, they opened a brewery in what is current-day Tamano City. In the search for better quality water, they moved the brewery in 1965 to the current location next to the Asahi River for its pure subterranean water. “Unlimited challenge” is the company’s philosophy. To that end, they have put much effort early on into making sake that uses Takashima Omachi rice, a rice cultivated originally for sake brewing near the new brewery in the Takashima district of Okayama City. Thanks to former master brewer Akio Nakahama (former president of the Bitchu Master Brewers Federation), Miyashita Sake Brewery was the recipient of the largest number of Gold Prize awards in Okayama Prefecture by the National Bureau's Research Institute of Brewing while Nakahama worked at Miyashita Brewery as head brewer for 40 years.The company was again awarded a Gold Prize in 1994 by the National Bureau's Research Institute of Brewing.He has been chosen as a “Contemporary Master Craftman”.Tatsuro Okazaki is the current master brewer, and was Akio Nakahama’s best pupil. He received training in sake making from the start from Nakahama.Together with assistant master brewers and young brewers, Okazaki brews sake following the motto of his master Nakahama, who taught that “harmony makes good sake”; they put all of their energy and physical power into sake making.The sake has a wonderful taste from which the umami flavor of rice spreads; it has a pleasant crispness, and a light and modest fragrance. the world through sake and meals. The concept of 'Sake Kobo DOPPOKAN' is "connecting the sake culture of Japan and the world". 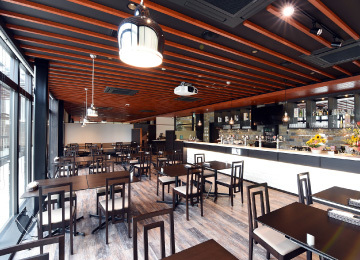 At the restaurant, there is a whiskey pub where guests can fully enjoy various sakes produced by Miyashita Brewing Company and food dishes that pair well with alcoholic beverages. At the shop "Sake no Izumi", various kinds of alcoholic beverages, including sake, produced by Miyashita Brewing Company can be purchased. Experienced staff are available to assist with purchases. Inquiries regarding sake brewery tours accepted here (reservations required).